We did the bronze package and felt like it was the perfect amount of time. The lunch buffet was delicious. 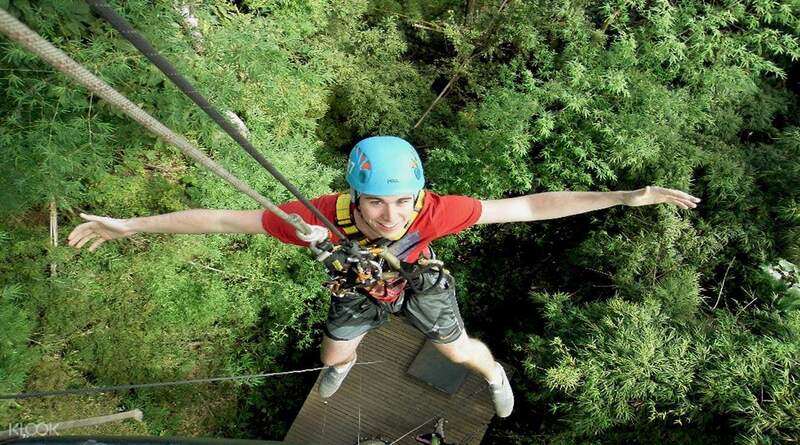 Go into the jungle for a thrilling ziplining experience complete with waterfall and jungle views. 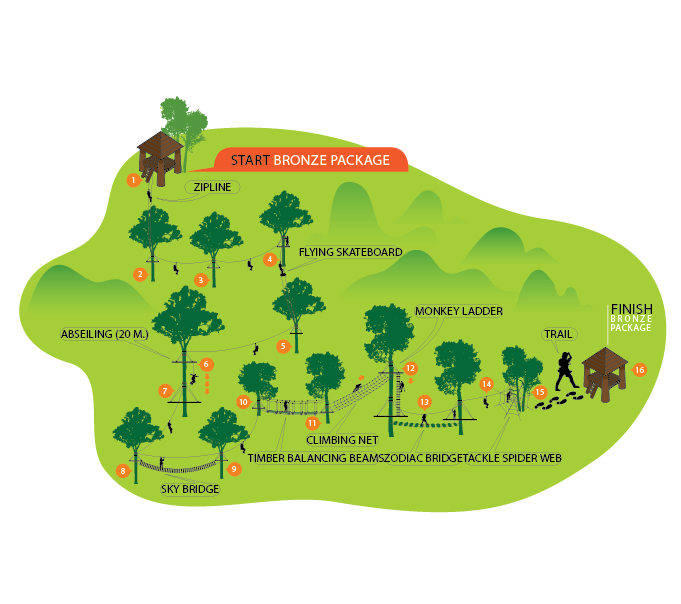 As you navigate your way around the course, you will need to pass many obstacles including the monkey bridge, timber balancing beams and climbing nets. Pick the package that suits you best and leave your worries behind with a professional crew who will help you with the equipment and ensure your safety throughout the activity. Lift your hands and soar through the air like an eagle! The Ranger Mr.Teerathep was very nice,He is friendly and helpful. He used my hand phone to take photos and videos. Made us had a great experience and memories. Excellent service! The Ranger Mr.Teerathep was very nice,He is friendly and helpful. He used my hand phone to take photos and videos. Made us had a great experience and memories. Excellent service! My son and daughter went for the silver package yesterday and they had a wonderful time going through the 20 stations. It was ery safe and there were 2 guides with them throughout the session. It was challenging enough for both of them and they would like to take on Gold package if given another chance. The course took less than 1 hr so I would recommend you to go for gold package which has 35 stations and last about 1.5 hr to 2 hr. overall the experiecence was positive and the guides were humurous amd caring. Very patient and helped to take photos and videos along the way. My son and daughter went for the silver package yesterday and they had a wonderful time going through the 20 stations. It was ery safe and there were 2 guides with them throughout the session. It was challenging enough for both of them and they would like to take on Gold package if given another chance. The course took less than 1 hr so I would recommend you to go for gold package which has 35 stations and last about 1.5 hr to 2 hr. overall the experiecence was positive and the guides were humurous amd caring. Very patient and helped to take photos and videos along the way. Note that there was no additional call or notification before the pick up but don't worry at all! Pick up was very easy and on-time and the mini van ride was very comfortable. Took about 1hr from old city to the eagle zipline area. Very safe and enjoyable. What made it better was the very humorous and passionate guides that we had. Didn't really get bitten much by mosquitoes which was a great thing. Lunch was decent (buffet style) though not the best but I was ok with it. Note that there was no additional call or notification before the pick up but don't worry at all! Pick up was very easy and on-time and the mini van ride was very comfortable. Took about 1hr from old city to the eagle zipline area. Very safe and enjoyable. What made it better was the very humorous and passionate guides that we had. Didn't really get bitten much by mosquitoes which was a great thing. Lunch was decent (buffet style) though not the best but I was ok with it. There was no confirmation of pickup time and we rang after latest time had gone by to be told 10 mins, 45 mins later finally arrived. Actual activity very well run , felt safe and well instructed, fantastic fun. There was no confirmation of pickup time and we rang after latest time had gone by to be told 10 mins, 45 mins later finally arrived. Actual activity very well run , felt safe and well instructed, fantastic fun. The coach picked up on time and brought us to the venue. The staff there were really cheerful and helpful. The Zipline experience was great and the staff were very helpful and patient to give us instructions and ensure our safety. They also helped us with the video shooting during the Zipline journey too. We were originally scared of heights but it turned out to be a thrilling and pleasant journey. Silver Package was simply NOT ENOUGH for us! Everything was great and should give a try! The coach picked up on time and brought us to the venue. The staff there were really cheerful and helpful. The Zipline experience was great and the staff were very helpful and patient to give us instructions and ensure our safety. 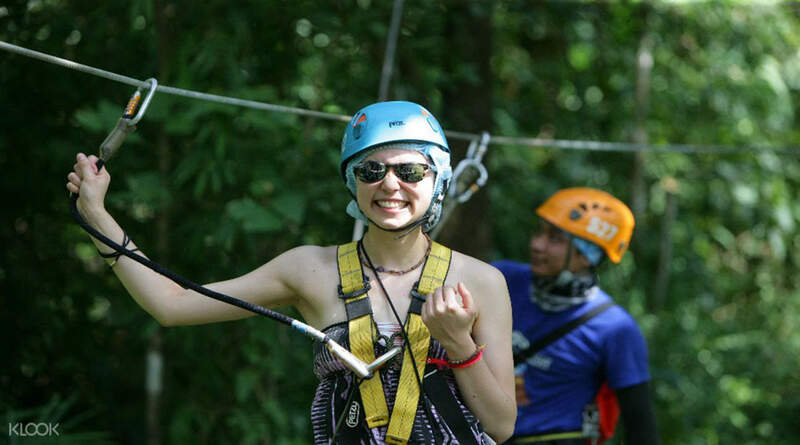 They also helped us with the video shooting during the Zipline journey too. We were originally scared of heights but it turned out to be a thrilling and pleasant journey. Silver Package was simply NOT ENOUGH for us! Everything was great and should give a try! What amazing trip and so exciting !! The intructor is so funny and they really care about you safety . It’s really worth to recommend to your friends and family to join. It’s a safe and you would regret if you didn’t join this in Chiang Mai. What amazing trip and so exciting !! The intructor is so funny and they really care about you safety . It’s really worth to recommend to your friends and family to join. It’s a safe and you would regret if you didn’t join this in Chiang Mai. Transport come on time and arrive the destination punctually. The guide are also very experienced and they at the same time very funny and hilarious. 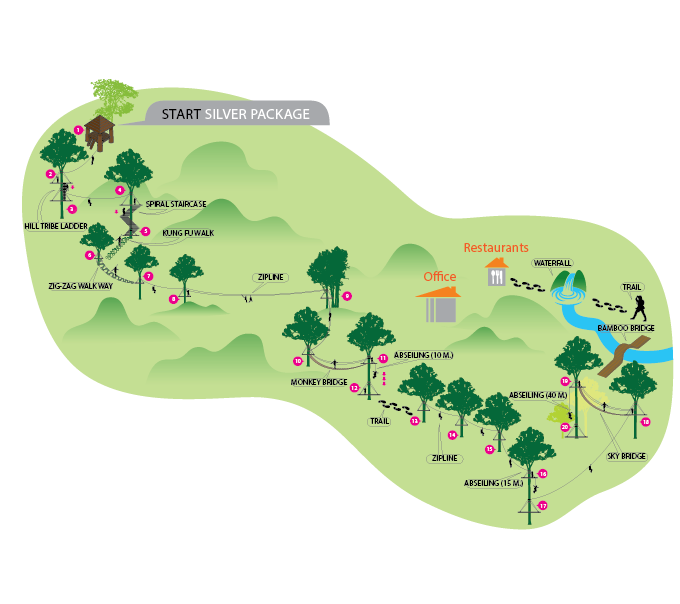 In the 1hr 15mins, you will enjoy the most exciting Ziplining in Chiangmai. Definitely worth a visit!! Transport come on time and arrive the destination punctually. The guide are also very experienced and they at the same time very funny and hilarious. 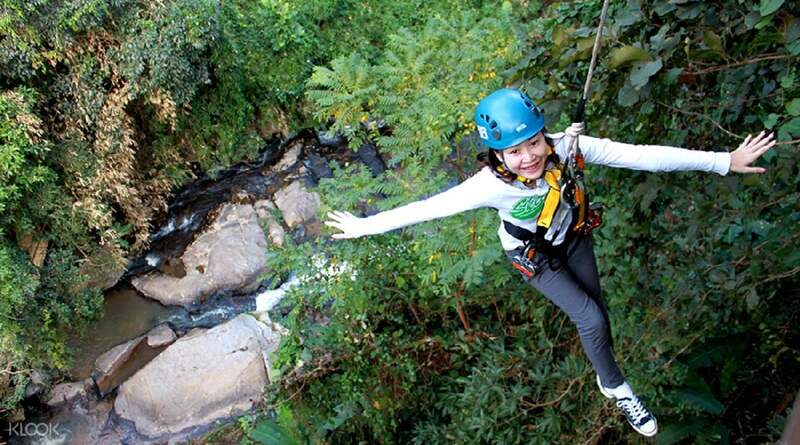 In the 1hr 15mins, you will enjoy the most exciting Ziplining in Chiangmai. Definitely worth a visit!! The eagle track itself is fun. But the tour operator did not double confirm the pickup time with us in advance. To play safe you may need to contact the tour operator directly yourself. 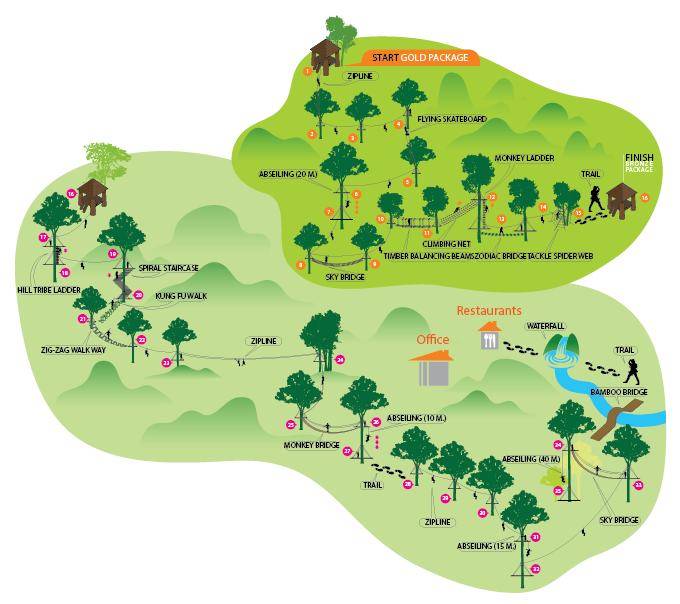 I would suggest to join the eagle track in local tourist companies. More flexible with lower price. The eagle track itself is fun. But the tour operator did not double confirm the pickup time with us in advance. To play safe you may need to contact the tour operator directly yourself. I would suggest to join the eagle track in local tourist companies. More flexible with lower price. We did the bronze package and felt like it was the perfect amount of time. The lunch buffet was delicious. We did the bronze package and felt like it was the perfect amount of time. The lunch buffet was delicious.